We’re approaching the half-way stage in the Championship, and the lead has changed more often than Paul Pogba’s hair. We’re through over 200 matches in this league campaign, and there’s plenty of excitement and drama to come. With the final international break out of the way, we face a four month run with no breaks from the club game. That includes another frantic festive period, and runs through 20 rounds of fixtures. We can expect new leaders and strugglers throughout, but that doesn’t mean we don’t know that to expect. The latest odds shouldn’t change too much, now that we’re three months into the campaign. We have a fair idea of the contenders, and which sides to watch for high scoring games. We’re using this break as a chance to an eye across the statistics so far and the main betting markets to lean a little more about the 2018/19 Championship campaign. Early in the season, it became clear that Marcelo Bielsa’s arrival had turned Leeds into strong contenders for promotion. They may lie third in the standings right now, but the bookies clearly have faith. The Elland Road outfit have found themselves as the favourites for the title after 17 games of the season. Bielsa’s side are playing with impressive intensity and style. Boasting the league’s best manager has put them on course for Premier League football in many eyes. Leeds can be found as even-money favourites for promotion, after sticking in and around the top two in the three months of the campaign so far. However, they have fallen from the top of the tree a few times in the run up to Christmas. Can they sustain a challenge? A look at their manager’s history suggest the latter stages could be a different story. We took a dive into the numbers earlier this season to look at how Bielsa’s sides tend to finish. His Athletic Bilbao side won five of their last 19 matches in 2011/12, and then just two in the final nine the season after. His Marseille side won half as many games in five months after Christmas than they did in the four months before. With a 46 game Championship season, that’s a worrying trend which could open the door to someone else. There are sides capable of challenging Leeds, which includes the current leaders Norwich. They’ve kicked on in recent months, and that’s taken them from mid-table into contention for an automatic promotion place. They’re now the form side in the division and given the manner of their performances it’s easy to see why they’ve been cut to second favourites for the title. Oddly, they’re only fifth favourites for promotion. That suggests the bookmakers think they’ll either kick on from here, or fade back into mid-table. That leaves Middlesbrough in the mix, they sit at 6/1 in the standings. So far they’ve shown enough to suggest they’re promotion candidates, losing just twice in 17 matches. That’s a record that no other side in the league can better. They’re just two points off Norwich, and after a consistent start. We’re pleased with their displays so far, having tipped them in our pre-season predictions for the Championship. The bookies have settled on two clear favourites for the drop, sides who have featured in the relegation betting since the summer. The current bottom two – Ipswich and Bolton – are heavily backed to make the drop down to League One. While they are each clinging to hope of survival, it’s easy to see why they’re as short as 2/7 and 2/5 respectively to drop out of the second tier. Ipswich are already five points shy of second from bottom Bolton. The basement side have won just once in their first 17 games. They have found themselves cut adrift from the rest of the teams above them, having spent the season at the bottom. Paul Lambert has arrived to change things, but there’s clearly not a lot of faith in him turning it around. The Tractor Boys have really struggled through the first three months of the campaign. That was predicted by the bookies, who had them pegged for the drop since Mick McCarthy left. As much as the Portman Road support would hate to admit it, they haven’t been able to match the results he got with this side. Bolton are a side strung together with odd signings and free agents, who have had looming financial problems since the summer. A strong start saw them in the top six very early on, but lately they’ve stun down into the bottom two. They’ve won once in 13 matches to land in a precarious position, and they find themselves odds-on for relegation. Despite only being in the bottom three on goal difference, you can find them as big as 13/8 to stay up this season. Of course, another side has to join that pair. That’s where things seem less certain in the betting. Third from bottom Hull are nearly 4/1 in places to go down, with Reading set at odds-on to go down. They’re level on points with Bolton, but 20th thanks to a solid goal difference. Paul Clement has won just 25.9% of his games with the Royals, which suggests that he’ll struggle to keep them out of the bottom three for long. Of course, it’s not just results that we can look at. With over 200 Championship matches played, we have a fair idea of what to expect from each side. We know who look to for entertainment, and where to expect clean sheets. West Brom are an interesting side to keep an eye on, having put together one of the best attacking line-ups outside the top flight. They’ve proved themselves going forward this season, hitting 37 goals in their first 17 games – an average of over two per game. However, that openness has a downside, with only six teams conceding more goals than the Baggies so far this season. Overall, a huge 89% of their home games have seen both teams score. Darren Moore has work to do as he tries to keep them in the race for a top six finish. In the short term, it seems like West Brom games will continue to see goals. Relegation favourites Bolton also feature here. They have a poor defence, but also the worst attacking record in the league. The Trotters aren’t one for a both teams to score accumulator, and neither are title hopefuls Middlesbrough. In typical Tony Pulis style, they’ve seen both teams score in 24% of their games so far. Boro have the meanest defence in the league – letting in just eight goals in their 17 matches this season. Only two other sides – Swansea and Nottingham Forest – have conceded fewer than one goal per game so far. They have all seen a trend of low scoring games, but no one has managed that quite like Boro. 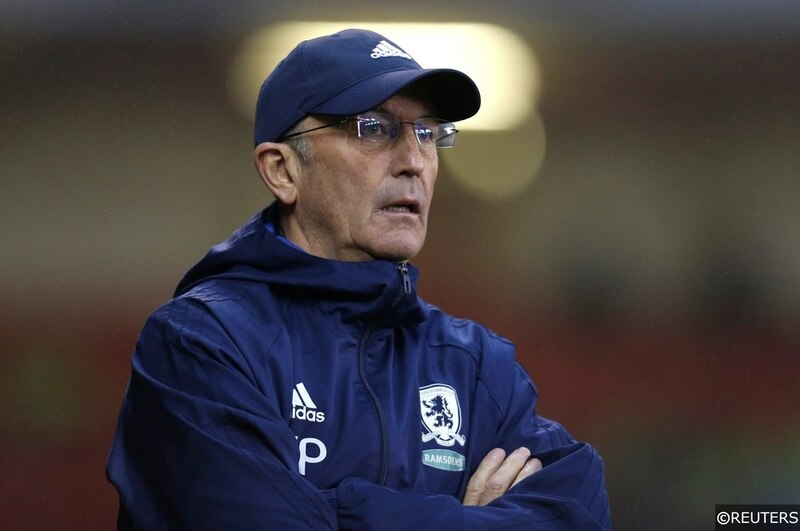 Pulis and his team have seen under 2.5 goals in 82% of their matches so far. While we made the point about Leeds tiring in the season, they certainly aren’t doing that in matches. In fact, they have the best second-half record of any side in the division. If we only counted scores from half-time to full-time, Leeds would be five points clear, with only two defeats. That’s key in this league, which sees games left quite close at half-time. Middlesbrough have the best first half record in the league, which has seen them win six of 17 opening halves so far. They are one of the lowest scoring sides in the league, yet their total of 11 goals before half-time is only one short of the league high. Overall, 98 of the 204 matches in the league so far have been level at half-time. One of the league’s most interesting stories this season has been the struggles of Brentford. The Bees were league leaders at one stage, and they made a blistering start. There were hopes that with the league’s top scorer Neal Maupay among their ranks, that they would climb back into the top six. While anything is possible in the Championship, many see the seven point gap between them and the play-offs to be too much. They can be found as short as 1/6 to fail to make the play-offs after tumbling down the table. Their appeals to play Premier League football at Griffin Park next season now look a tad premature. Categories: Blog and Football. Tags: betting advice, championship, EFL, and stats. Team Tag: championship, championship betting, and sky bet championship. League: England Championship. Sports: Football.